At Thornhill Security we provide a wide range of locking solutions and security safe products & services to both domestic and commercial clients in Bristol, the South West and across the UK. Whether you simply need to replace the window and door locks on your home, are looking for an effective access control system for your commercial building or want to protect your valuables against theft or fire by installing a security safe our experienced team of security specialists can help you find the right solution. 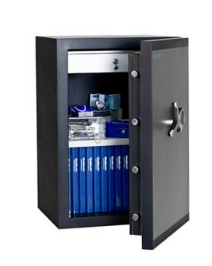 We have been providing safes, security and locking solutions for over 40 years and pride ourselves in giving a complete service to our many happy customers. Our service starts with some initial, impartial advice they can trust on the best product to suit their needs, continues through the efficient supply and installation of their safe or locking system and is available for many years to come via our quality after sales service including repairs and upgrades should anything go wrong or their requirements change. We supply and install products from the leading lock and safe manufacturers and as members of the Master Locksmiths Association, Eurosafe UK, an approved Mul-T-Lock supplier and holding accreditations from both Safecontractor and Constructionline you can be assured of the quality of the products and services we provide. Please click on the relevant link below for further information about each of these services or call our team of security experts on 0117 9674994 who will be happy to help. Further information can be found on our FAQ page and Blog.